Enjoy a cozy dinner with this easy shepherd's pie recipe. 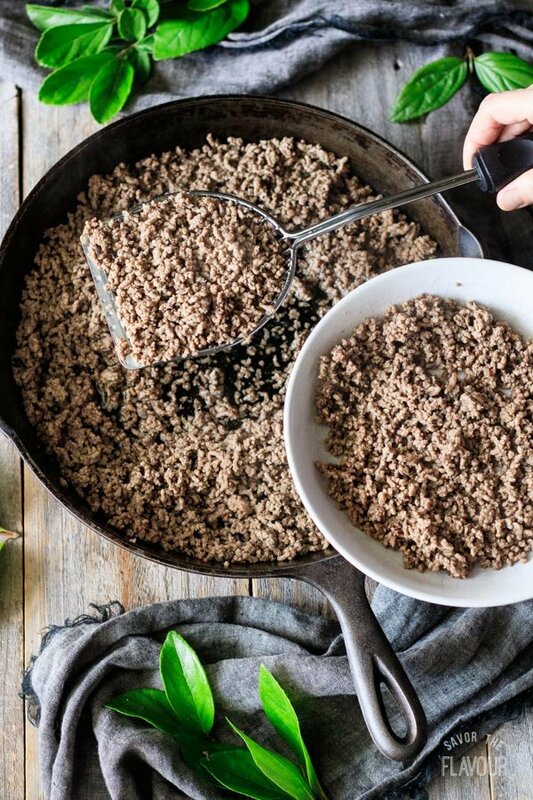 It's a simple recipe made with gravy and ground beef in a cast iron skillet. 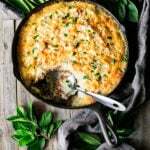 This classic comfort food is cooked on the stovetop, sprinkled with cheese, then baked in the oven to make it golden brown. Your whole family will be asking for seconds! Looking for the ultimate comfort food for meat and potato lovers? 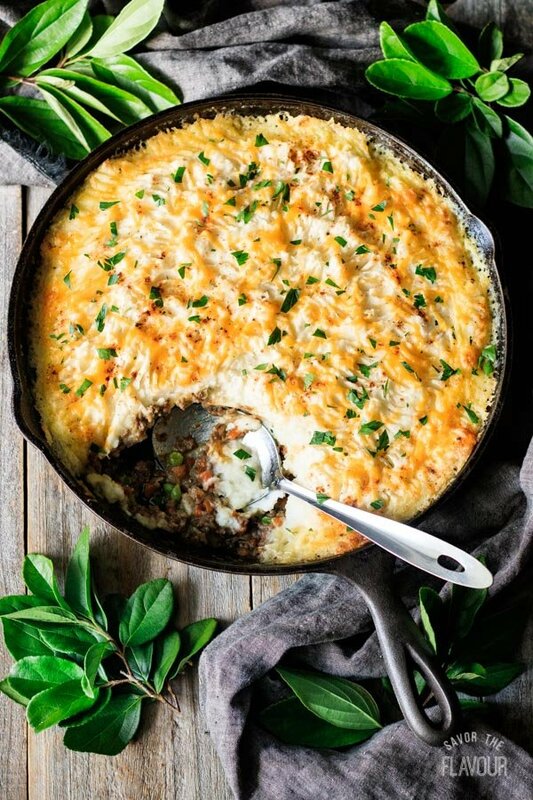 Try this easy shepherd’s pie recipe. Your kids will devour it, and with one taste you’ll agree it’s like a hug in a skillet. 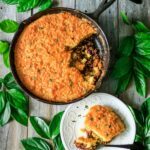 My girls are mightily fond of this easy shepherd’s pie recipe, so they are always excited to hear it’s on the menu. 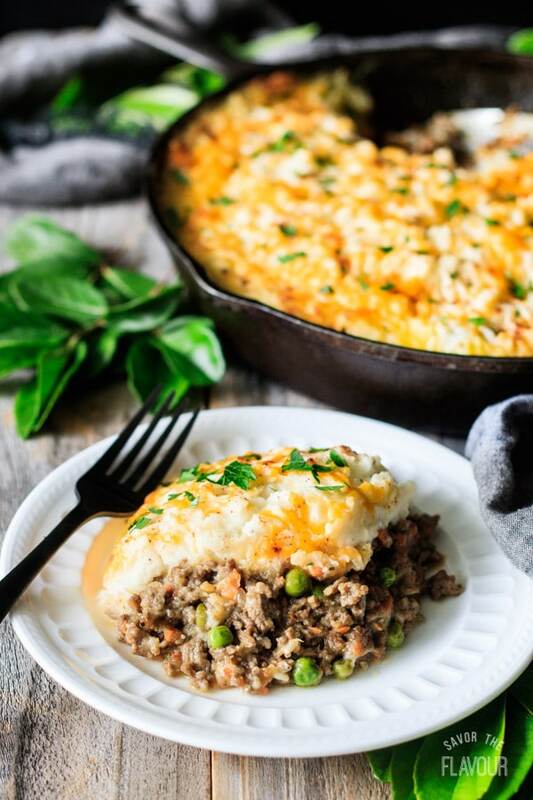 In the United Kingdom, shepherd’s pie is made with ground lamb or shredded lamb, and cottage pie is made with ground beef, so the only difference is the meat. 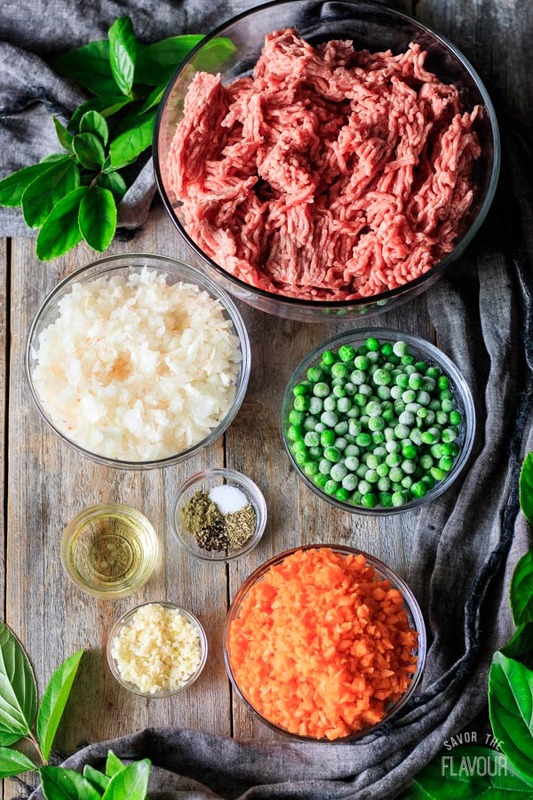 In the U.S. and Canada, shepherd’s pie is made with ground beef or shredded roast beef, as it is more readily available. 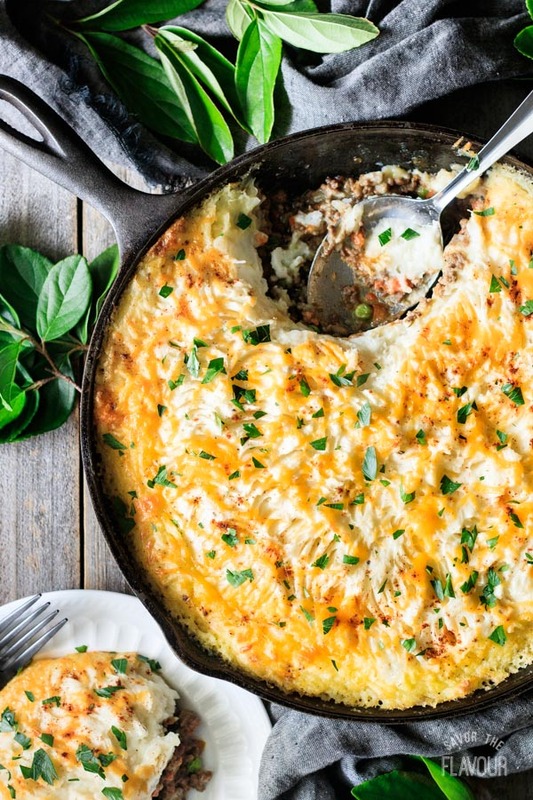 Shepherd’s pie is a dish that meat and potato lovers drool over. It’s a classic cold weather comfort food. 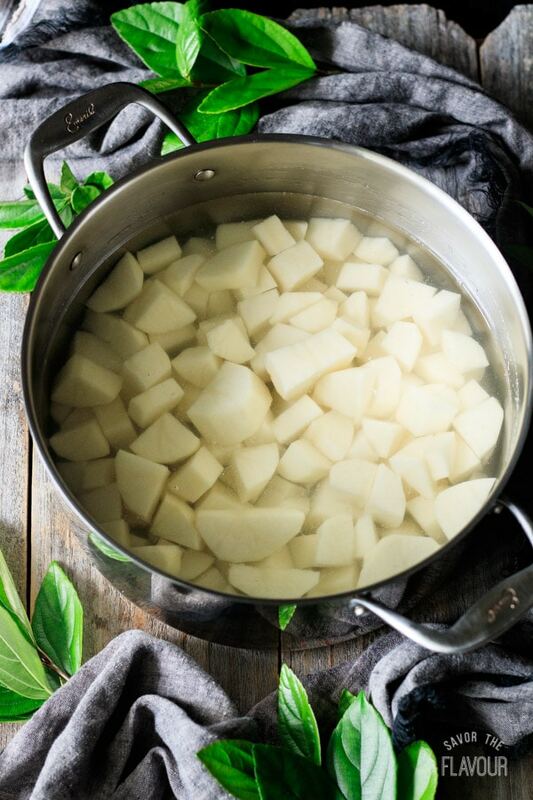 The base is a meat and vegetable mixture that is topped with fluffy homemade potatoes and baked in the oven until it’s golden brown on top. 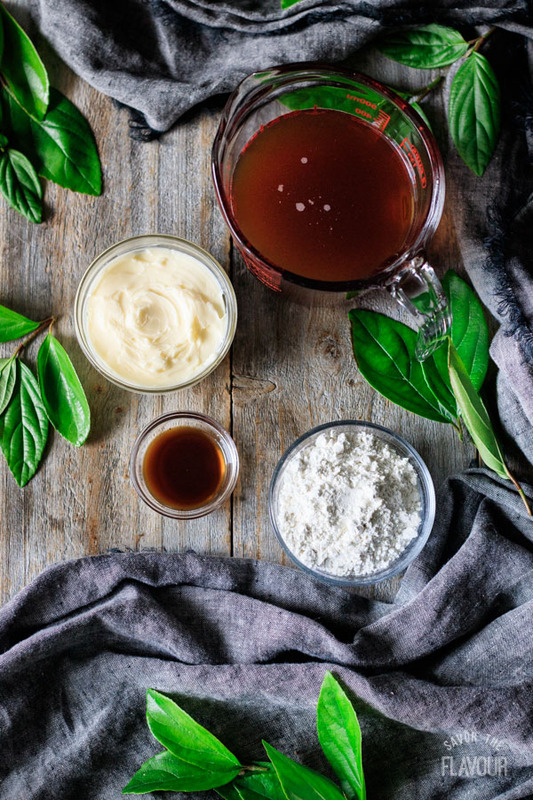 Traditionally, there isn’t any pastry in the dish at all, but if you’re up for a twist it would taste divine with pastry on top. Certainly! This an excellent make ahead recipe. All of it can be made ahead of time. When ready, cover the skillet or your casserole dish with foil and refrigerate. While the oven is preheating, take out the shepherd’s pie and let it sit on the counter. Increase the cooking time to 40 minutes and broil for 3 minutes to get the textured potatoes extra crispy. You can also make it on a Monday using leftovers from Sunday’s pot roast dinner. If you choose this option, use 4 cups of mashed potatoes, 1 cup of gravy, and 3 cups of shredded pot roast. Yes, this recipe freezes really well. It’s best to freeze it before you bake it. 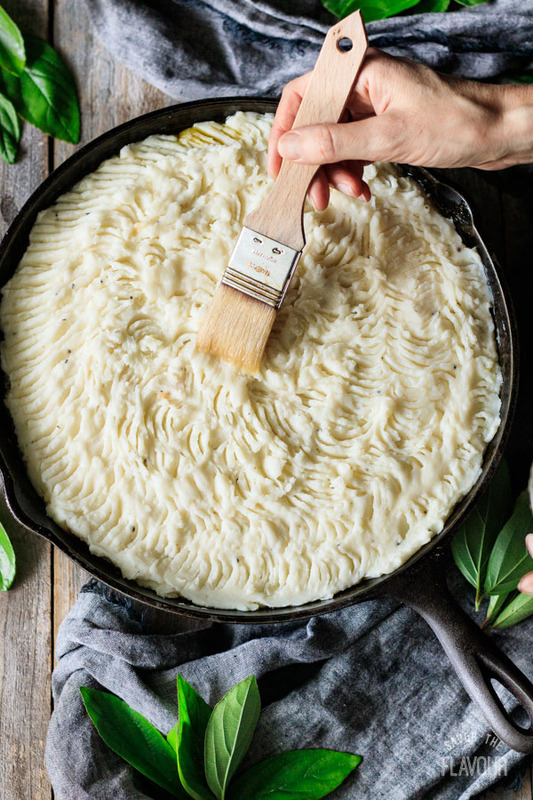 If you are planning on freezing it, assemble it in a 9×13-inch pan and not a cast iron skillet. Wrap the pan in foil so it’s airtight and won’t get freezer burn, then freeze for up to 2 months. When ready to eat, thaw in the fridge overnight. If it’s completely thawed, bake at 400 F for 40 minutes and broil for 3 minutes. If it’s partially frozen, increase the cook time to 1 hour and 10 minutes and cook it on the bottom rack. When it’s done it should be golden brown on top and heated all the way through so the filling is steaming hot. First gather the ingredients for the mashed potatoes. 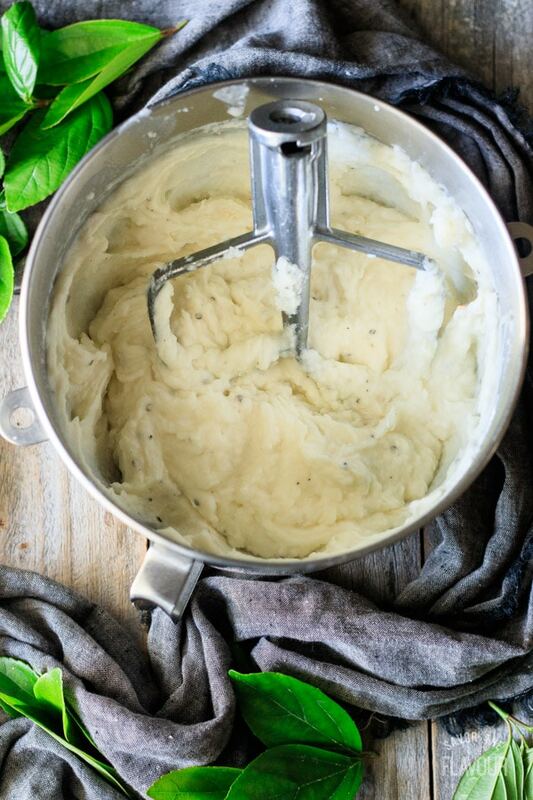 If you’re using leftover mashed potatoes, you’ll need 4 cups. To roast the garlic, rub olive oil on the 5 large peeled cloves and bake for 15 to 18 minutes at 425 F. Once cooled, smash the garlic with a bottom of a cup. Wash, peel, and cube the potatoes. Place in a large pot of cold water. Bring to a boil then simmer until fork tender, then drain. Mix the potatoes in the bowl of a standing mixer with the butter, smashed roasted garlic, sour cream, buttermilk, salt and pepper. Whip until smooth and adjust seasonings according to taste. Gather the ingredients for the meat and vegetable mixture. Finely chop the carrot, onion, and garlic. I used frozen peas for ease, but fresh would also work. 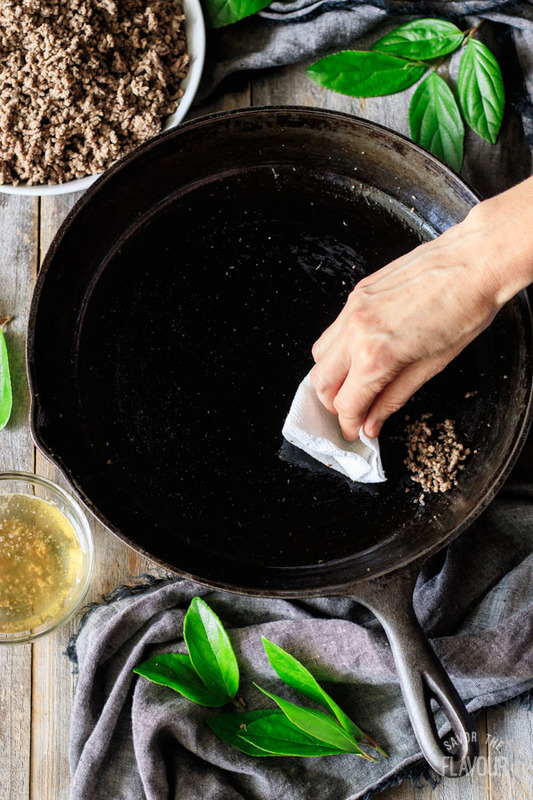 Heat the olive oil over medium-high heat in a cast iron skillet and cook the ground beef until it’s no longer pink inside. Break up the pieces as it cooks with a wooden tuner or spoon. Drain in a colander over a bowl or use a large slotted spoon. Wipe out most of the remaining fat from the ground beef with paper towel. Add one tablespoon of the rendered fat back into the skillet, and sauté the onions and carrots for 8 minutes, stirring occasionally. Add the minced garlic and 1/4 teaspoon of salt, cook until fragrant, then add the rest of the spices. Stir until well combined. 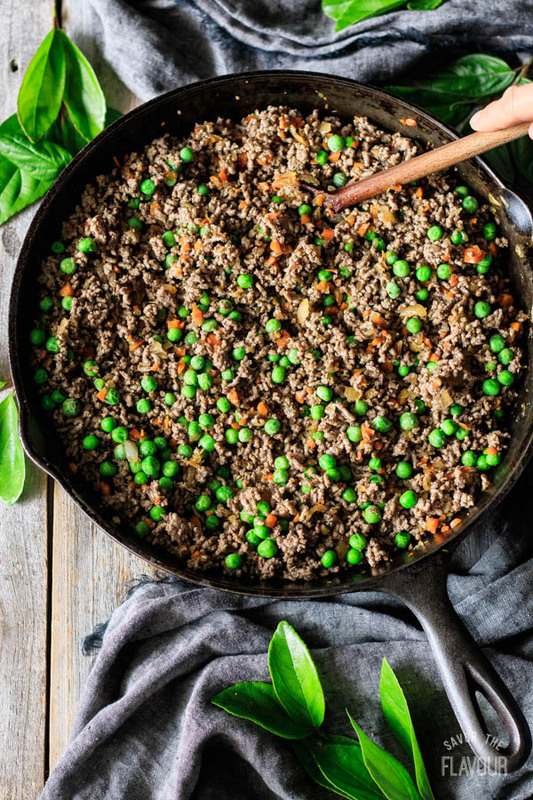 Put the cooked ground beef and peas into the skillet. Stir and heat through over medium low heat. Start the gravy by measuring out the ingredients. Melt the butter over medium heat and gradually add the flour, whisking constantly for 2 minutes to cook the flour. Add the Worcestershire sauce to the beef stock and whisk one cup of broth into the roux. As the gravy thickens up, add the last 1/2 cup of stock. Mix the gravy into the hamburger vegetable mixture. Taste and adjust seasonings. 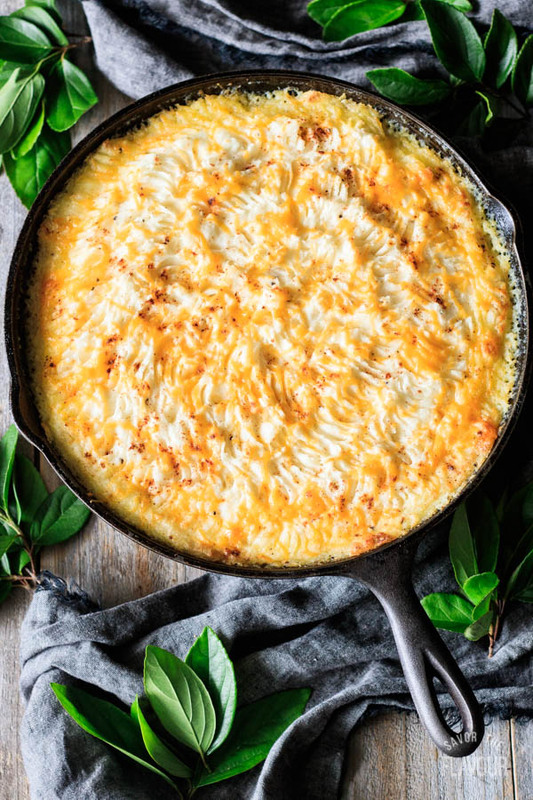 For the topping of the shepherd’s pie, get one egg white, some grated cheese, smoked paprika, and chopped parsley. 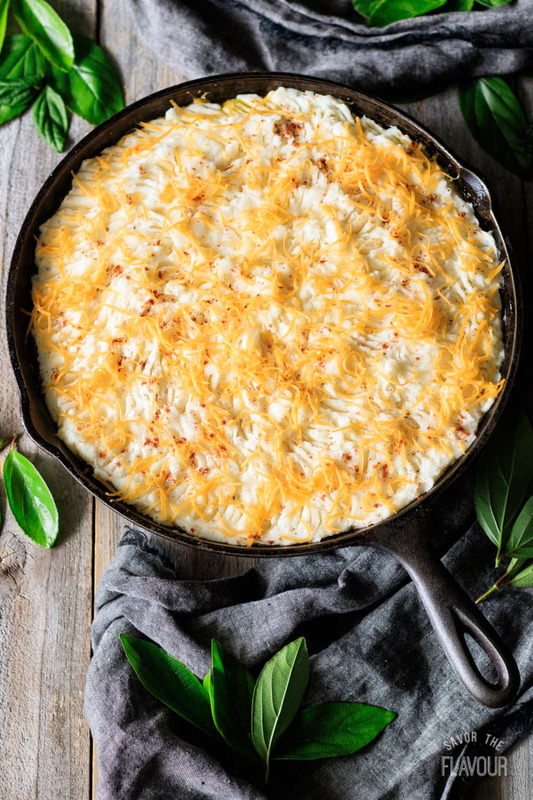 Assemble the shepherd’s pie in a 10-inch cast iron skillet, a large Dutch oven, or a 9×13-inch casserole dish. Start with the meat and veggies, then spoon the mashed potatoes on top. Fluff up the surface with a fork, and brush with egg white to help it get golden brown. Sprinkle on smoked paprika and grated extra sharp cheddar cheese. If you are planning on making this ahead, this is when you would cover it with foil and place in the fridge. Preheat the oven to 400 F. Bake for 20 minutes, then broil for 3 minutes. Garnish with chopped parsley, and let stand for a few minutes to set. Don’t want ground beef? Use ground turkey or leftover roast beef. Want to use lamb? Use ground lamb or chopped lamb and add fresh mint to the gravy. Want to use leftover potatoes? Make sure to reserve 3 1/2 to 4 cups. Want additional veggies? Add 1/2 cup kernel corn and 1/2 cup chopped parsnips. Need this vegetarian? 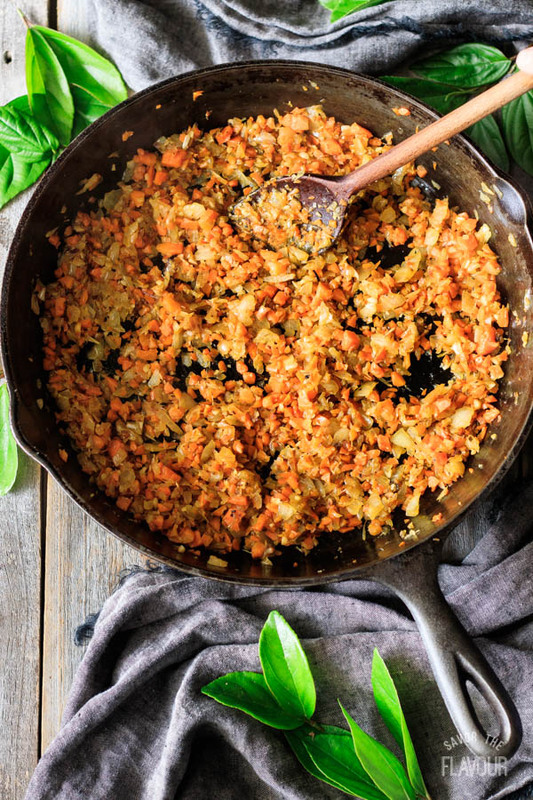 Use mushrooms, cooked green lentils, and vegetable broth. Want it spicy? Add 1/2 teaspoon red pepper flakes. Don’t own a cast iron skillet? Use a 9×13-inch pan or an oven safe Dutch oven. Potato options? 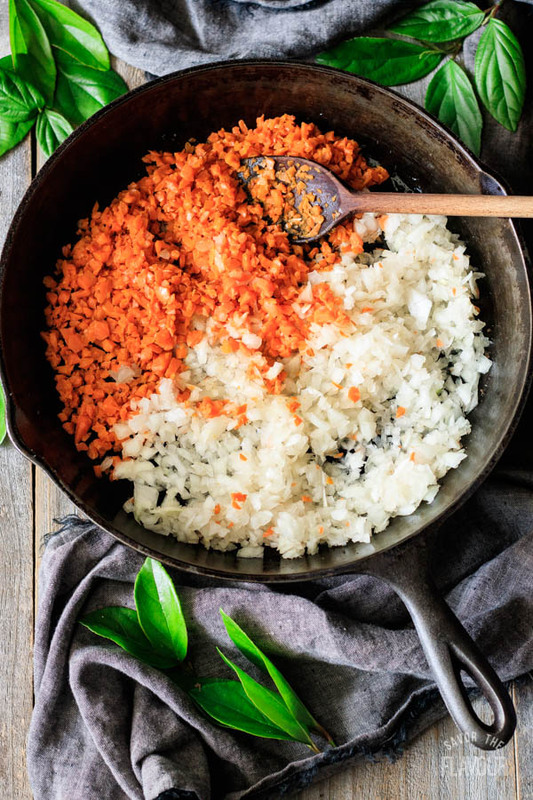 Mash, whip or rice the potatoes for the texture you want. Counting carbs? Use mashed cauliflower and sprinkle on fresh parmesan cheese. Overfilled the skillet? Put it on a cookie sheet to catch drips that could bubble out. 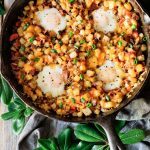 Love skillet dinners? Check out these other recipes for great ideas. Skillet Chili Cornbread: combine two great dishes in one with this recipe. 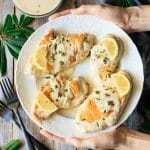 Creamy Lemon Chicken: crispy chicken breasts with a luscious creamy lemon caper sauce. The pleasure of a 5-star review for this shepherd’s pie recipe would be greatly appreciated. 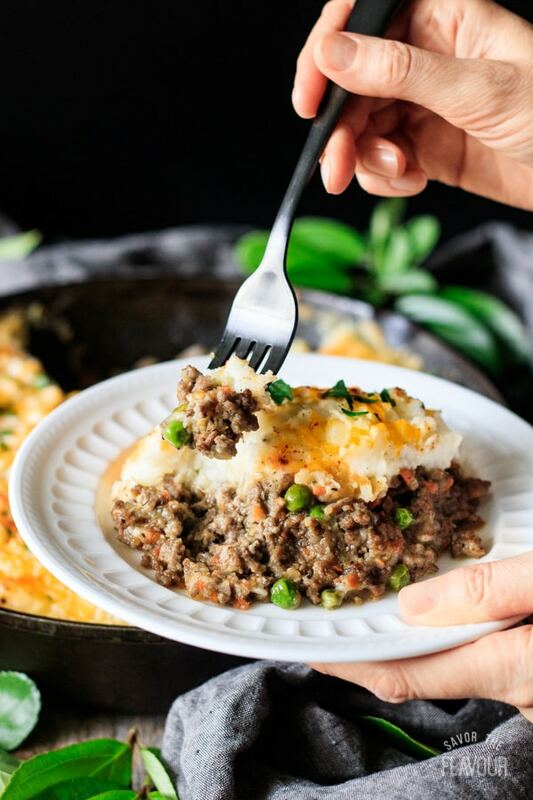 Enjoy a cozy dinner with this easy shepherd’s pie recipe. 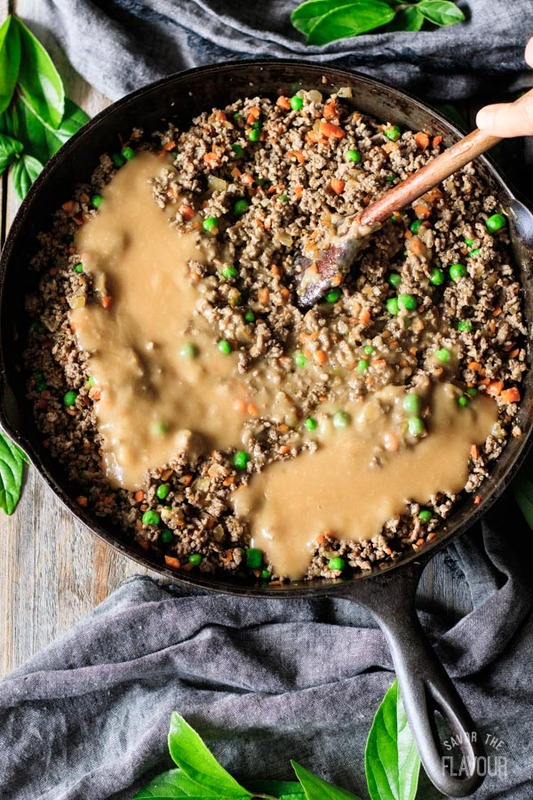 It’s a simple recipe made with gravy and ground beef in a cast iron skillet. This classic comfort food is cooked on the stovetop, sprinkled with cheese, then baked in the oven to make it golden brown. Your whole family will be asking for seconds! Rinse, peel and cube the russet potatoes. Put them a large pot of cold water. Bring to a boil then simmer until fork tender, then drain. 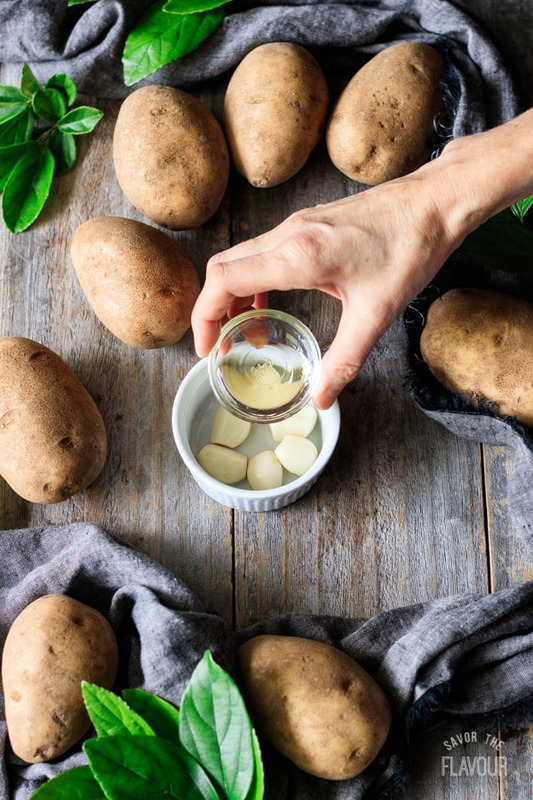 While the potatoes are cooking, preheat the oven to 425 F. Peel the garlic cloves and toss with the olive oil in a small ramekin. Put the ramekin on a baking tray and bake for 15 to 18 minutes. Let cool, then smash with the bottom of a cup. 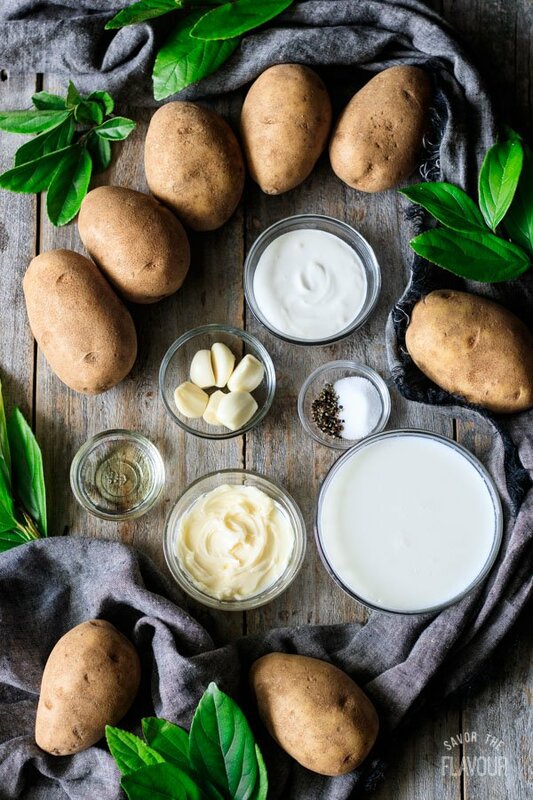 Place the drained potatoes, smashed garlic, butter, sour cream, buttermilk, salt and pepper in the bowl of a stand mixer fitted with the paddle attachment. 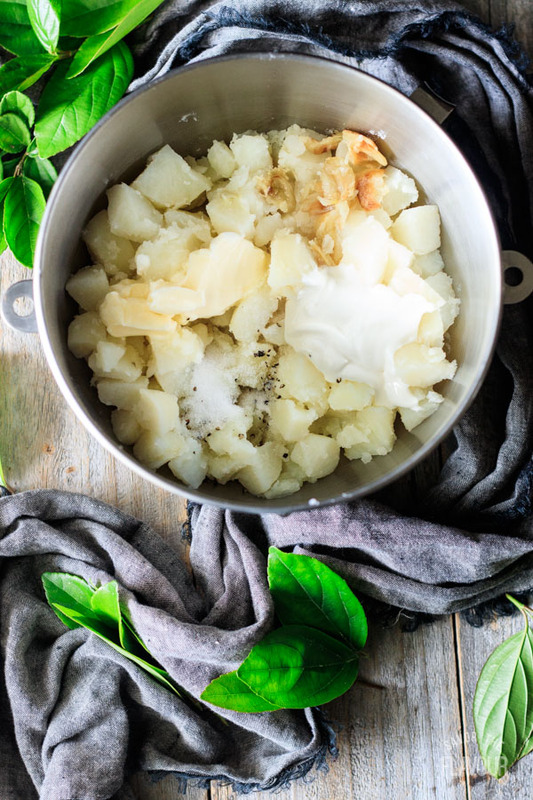 Whip the potatoes until they are smooth and creamy. Adjust butter, sour cream, buttermilk, and seasonings according to taste, then set aside. Cook the ground hamburger in a 10-inch cast iron skillet set over medium heat, stirring occasionally until all the pink is gone. Drain off the fat by pouring the cooked meat into a colander placed over a bowl to catch the fat drippings. You can also scoop up the hamburger with a large slotted spoon and place in a bowl then pour the fat from the skillet into a small bowl. Let the skillet cool for a couple of minutes, then wipe out the excess fat and remove any leftover hamburger with a spoon. Add one tablespoon of rendered fat back into the cast iron skillet and let it heat over medium-high heat. Add the carrots and onions to the skillet and cook for 8 minutes, stirring occasionally. Add the garlic and 1/4 teaspoon salt and cook until fragrant, roughly a minute. Add the rest of the spices and stir until well combined. Stir in the cooked hamburger and the frozen peas and heat through over medium low heat. Melt 4 tablespoons of butter in a small skillet set over medium heat. 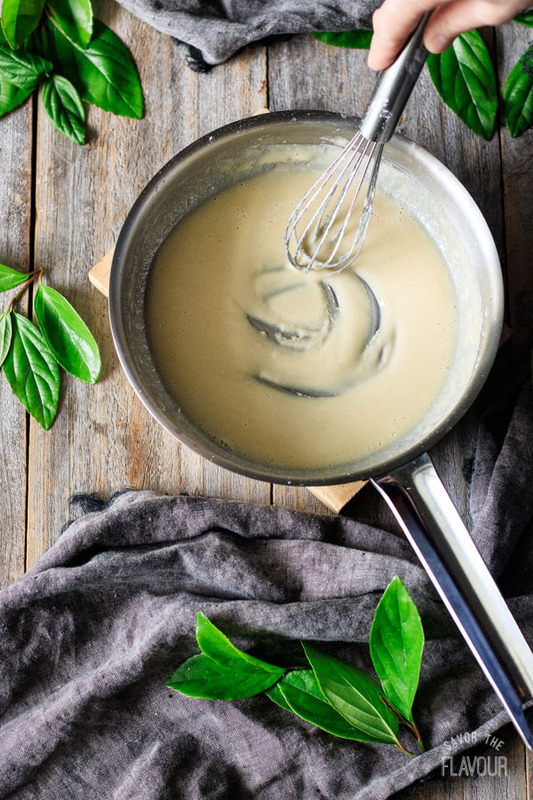 Gradually add the 4 tablespoons of flour, whisking constantly, to make a roux. Cook for two minutes, whisking constantly to cook the flour. Pour 2 teaspoons of Worcestershire sauce into the beef stock and gradually whisk of 1 cup the stock into the roux. Keep whisking for a minute or two until the gravy has thickened. Add the remaining 1/2 cup of beef stock and stir. 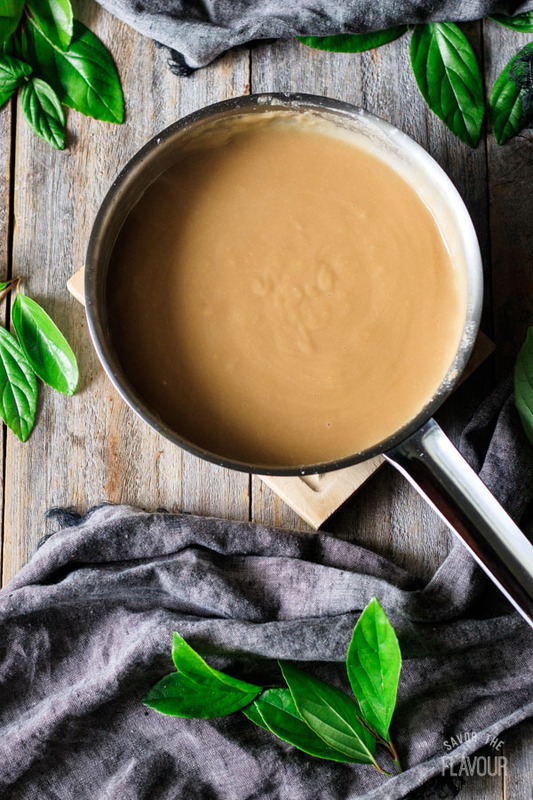 If needed, add the 1/2 cup of filtered water to thin out your gravy. Once your gravy is the consistency you like, pour it over the hamburger veggie mixture in the large cast iron skillet. 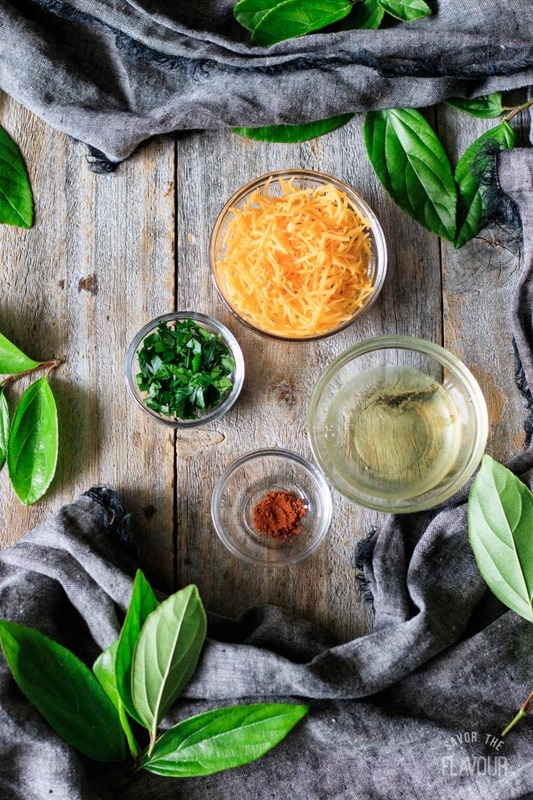 Mix well, taste, and adjust seasonings as desired. Fluff the potatoes with a fork to make them textured, then brush them with egg white. Sprinkle the grated cheddar cheese and smoked paprika evenly on top. Cook at 400 F for 20 minutes, then broil for 3 minutes until golden brown on top. Garnish with 1 tablespoon of chopped fresh parsley. Serve warm.